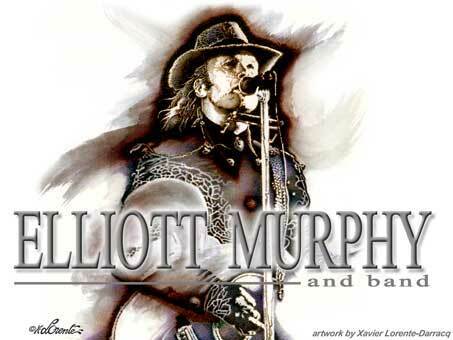 Elliott Murphy is a talented songwriter, drawing worthy comparisons to Bob Dylan, and his songs of loss and survival are delivered with a haggard voice and punchy Rock & Folk arrangements. Elliott Murphy has released a dozen or so records that have made him a treasure in Paris, where he lives. Elliott Murphy grew up in an upper-middle-class family. Acquiring his first guitar at the age of 12, Elliott Murphy quickly advanced on the instrument. Within a year, he was playing in his first band. In 1966, Elliott Murphy's band the Rapsillions, placed first in a New York statewide Battle of the Bands. Together with his brother Matthew Murphy, Elliott Murphy spent the late 1960s in Europe, performing his original tunes in subway stations and street corners. Elliott Murphy also had a bit role in Federico Fellini's 1972 film "Roma". 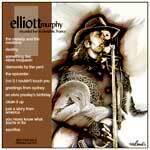 Returning to the United States in 1973, Elliott Murphy formed a band, "Elliott Murphy's Aquashow". Performing frequently at New York hot spots, including Max's Kansas City and the Mercer Arts Center, Elliott Murphy and the group became associated with the art-rock scene that included Patti Smith and the New York Dolls. Although their 1975 debut album, "Aquashow", was critically acclaimed, it failed to break through commercially. Elliott Murphy's subsequent 1970s recordings - "Lost Generation", "Night Lights" and "Just a Story From America" - sold poorly. In 1980, Elliott Murphy launched his own record label, Courtesan, with a six-song EP, "Affairs". The following year, he released a folk-rock album, "Murph the Surf". Elliott Murphy's album "Party Girls/Broken Poets", released in 1984, was nominated for a New York Music Award as Album of the Year. Elliott Murphy has consistently worked with innovative producers. "Milwaukee", released in 1986, was produced by Jerry Harrison of the Talking Heads, while "Change Will Come", released in 1987, was produced by James Ball of the Smithereens. 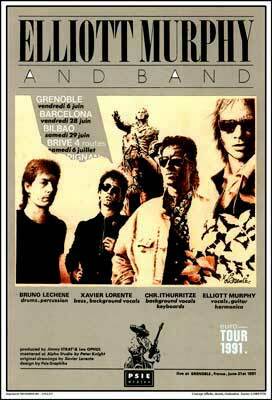 A live album, "Hot Point", released in 1989, featured lead guitar by Chris Spedding. Despite the state-of-the-art sound of his albums, Elliott Murphy continued to encounter commercial resistance in the United States. In Europe, however, it was a much different scenario. Elliott Murphy's concerts were packed by enthusiastic audiences while his albums sold well. In 1990, Elliott Murphy emigrated to Paris, where he continues to live with his wife, Francoise, and his son, Gaspard Murphy. Shortly after moving to Paris, Elliott Murphy released a 24-song album, 12, that was shortened and rechristened "Unreal City "upon release in the United States. In 1995, Elliott Murphy assembled a new band that featured drummer Andy Newmark (Roxy Music, Eric Clapton), acoustic and electric bassist Cuch Merchan (Eurythmics) and percussionist Luis Jardim (Rolling Stones). Recorded at ICP Studios in Brussels, Belgium, the album included a duet with Bruce Springsteen on Elliott Murphy's tune "Everything I Do (Leads Me Back to You)" In 1998, Elliott Murphy returned with the album "Beauregard". "Terre Commune" was issued in 2001.